Although involved in the Kanyike Project for many years as a Trustee this was my first visit to see the reality of life in the villages. I was immediately struck by three things: first, sheer awe at what has been achieved in the 30 years that the Project has been running and the achievements of the founders and supporters both in the UK and in Uganda; second, the amount of work still to be done and also a degree of trepidation about the journey ahead for us as a charity; and third, the resilience, friendliness and happiness that the Uganda people exhibited. The work of the Project is so vital for the future of the villages. I have known about the inspiring work of The Kanyike Project for many years so planning a visit to meet the people of Kanyike and see how the Project operates in Uganda was very fulfilling. The highlight of the trip was visiting the Kanyike Rise and Shine Nursery and the Magejjo Primary School. Robert and I were welcomed with songs and smiling faces and we took great pleasure in distributing gifts of stationery, sporting equipment and teaching supplies donated by our UK friends, family and colleagues. We saw the excellent work of the team of volunteers who built the nursery in March 2014. It doesn’t matter where you are from or what your living circumstances are: it takes courage to consult a doctor when you are ill. Integrated Outreach Days are a very effective way of reaching out to people in remote areas. 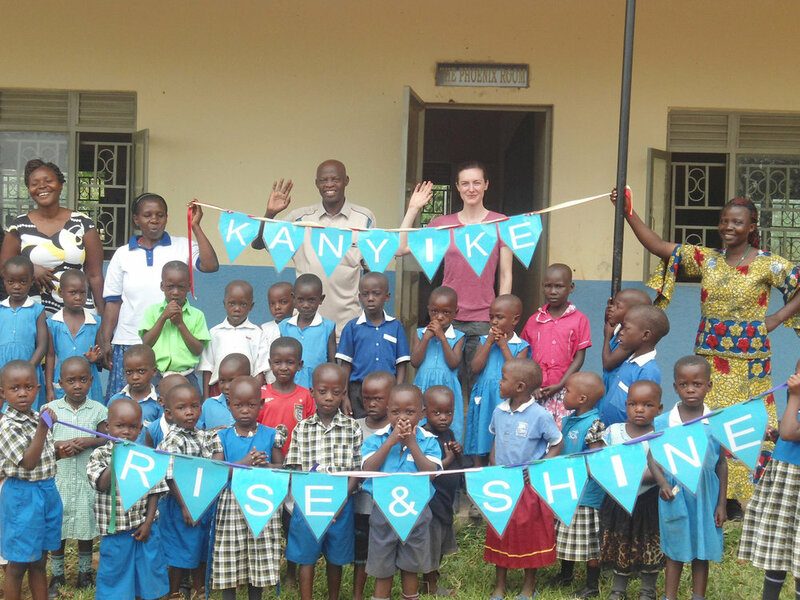 We travelled with the Kanyike Project team to a village 10 miles away from the Kanyike HQ. On these away days Kanyike Project staff are able to offer a number of services including diagnosis of health issues, distribution of medicine, plus counselling. It was wonderful to see how supportive the Kanyike Project staff are towards patients and to see people treated with dignity and care. Rose is a success story of The Kanyike Project. She was diagnosed as HIV positive in 2003 but now restored to health. Each time Father Kakuba passes her house she rushes to greet him and thanks him for saving her life. Without the early diagnosis and regular medical treatment she receives from The Kanyike Project, her story could be very different indeed. We were overwhelmed by the welcome we received in the Kanyike Project villages by adults and children alike. There is a wonderful sense of community among the people and we felt privileged to feel part of that. I lost count of the number of times we were thanked for the support coming from the UK, which is a credit to all the fundraising initiatives, sponsorship and donations received for underprivileged communities. If you get chance to go to Uganda and visit this amazing place then do! I was able to visit The Kanyike Project for a week in September 2015. The trip was everything you expect and so much more. It was very interesting for me to see how people dealt with the lack of things like water, power, communication and logistics. 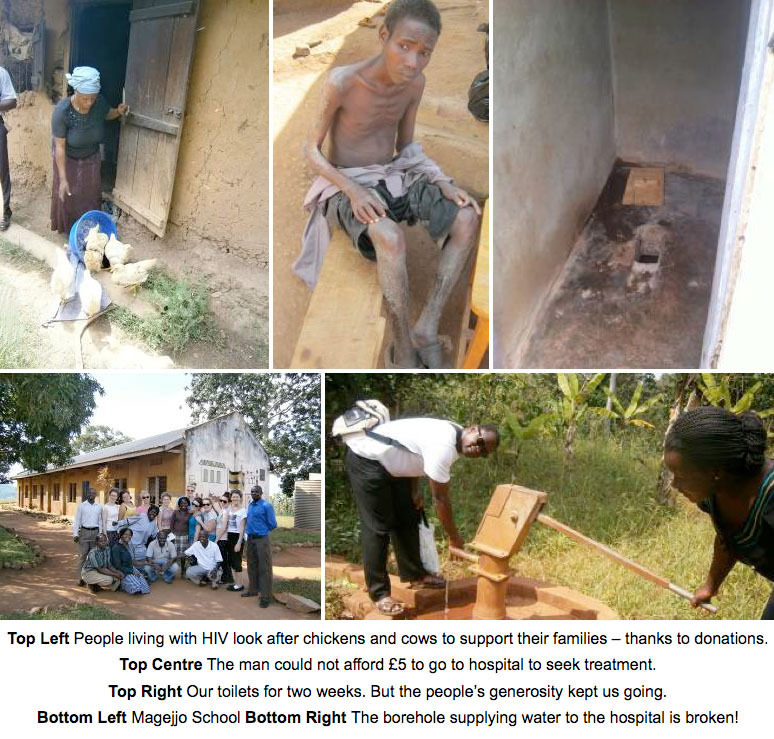 Being off the grid, projects to upgrade the infrastructure - like the one currently under way to bring water up from the old spring to the centre - will have a dramatic effect on the lives of both the staff and patients. Visiting the skill centre was great. Deus, the Carpentry Manager, was able to answer all my questions in the woodwork shop. It was fascinating to see how they use waste wood shavings and overcome limitations like the lack of power tools. Taking part in both the Outreach Day and Medical Away Day was very grounding; watching a 21 year old mother fail the AIDs test was tough. Making people aware of these events presents its own challenge. To overcome this on the Medical Away Day, David, one of the nursing staff, had walked around the local area for two days before with a megaphone announcing the purpose of the event and encouraging people to get tested. The folk in Uganda are just amazing, we spoke with so many people and the children were wonderfully curious…or maybe it was the fact that I had packed 6kg of barley sugar sweets to share! In July 2014 a group of students from St Francis' College spent two weeks in Kanyike. We arrived at the centre, were warmly welcomed by the staff and settled into our home for the next two weeks. We had been thoroughly prepared for the basic facilities such as pit-latrines, open-air shower cubicles, buckets of cold water and very basic sleeping accommodation. The toilets proved to be perhaps the biggest difficulty during our stay; but the students adapted brilliantly and were incredibly supportive of each other. I was amazed at the good humour with which they faced every challenge and proud of the way they dealt with whatever situations they found themselves in and showed warmth and friendship towards everyone they met. They sang and played with the local children for hours; sang for classes at the school in English and Luganda; taught really challenging lessons in English grammar; played netball in the baking heat and stood up and addressed the congregation in the church. At the out-reach clinic, they assisted the staff throughout a very long hot day, helping to put up and take down the tents, weighing babies, dispensing drugs and filling in child health records. You can read more about our trip and see more photos on the Kanyike blog. In January 2014 I visited the Kanyike Project with my friend Jo. A week before I left, nerves kicked in. However when I got there I realised that everyone was so kind, friendly and welcoming, (even though the the living accommodation and standards were more basic than I could have imagined). I helped run the HIV/AIDS outreach clinic by dispensing drugs and visited several families affected by the illness. This was eye-opening. It was evident how much the villages are truly benefiting from the project. We also spent a few amazing days in the school where we met teachers and pupils. One thing I really struggled with was how their lives are all about survival: they have little time for leisure, something I believe as a country we take for granted. Jo and I had the privilege of attending a graduation ceremony, a Ugandan funeral and several Sunday Masses. I'm glad we got to experience such fascinating events. I visited the Kanyike project for two weeks. I had never been to an African country so was unsure what to expect. The living conditions were daunting but I quickly adapted. I got to experience a taster of most of the aspects of the project. This included shadowing at the local school, visiting HIV suffers in their homes and helping with the children at the Health Centre. My favourite experience was meeting all the children. They were so happy to see us and just play simple games even though they didn't have any toys or speak any English. We worked out how to communicate!. The experiences I had and the people I met will always stay with me and I would love to return to see where the money raised by my business has been spent to improve the villagers' lives. St Francis' College has supported the Kanylke Project since 1987. Over this time, individuals from the College have visited the villages and by 2012, it was at last possible for a group of students to visit. The aims of the visit were two-fold; a journey into ourselves and our lives, and a journey into the lives of the people of Uganda by sharing their life-style, if only for a short time. These photos show our experience of life in Kanyike, some of the people we met and some of the Kanyike projects in action. I was a volunteer at Kanyike for a month and can definitely say that the memories will stay with me forever. To go from the comfort of daily life in England to living without electricity or running water was quite a shock - it is incredible to think that facilities we regard as essential are considered luxuries by the people supported by the Project. It was simply amazing to spend time with the people of Kanyike and experience a little of their life. I spent the first three weeks with the health team and saw first-hand the difficulties faced by the community, especially those with HIV. In my last week I taught English to primary schoolchildren, which was a fantastic experience. The children were full of energy and seemed to hang on my every word - I hope they enjoyed the lessons as much as I did (and maybe even learned something!). I am full of admiration for the Kanyike Project, which does such tremendous good for the community: providing toilets at the school and in individual houses; ensuring essential medicines are available for those suffering from HIV, and equipping the school with educational material. However, it was very apparent that there is still a great deal to be done! St Francis' College has been associated with the Kanyike project for many years and is proud to continue that association. On my visit, I witnessed how this project has transformed the lives of those living in the area. Local people, in a sustainable way, have developed farming through their livestock and crops. Healthcare is improving rapidly and the local primary school is thriving. The students at St Francis' College raise funds enthusiastically, knowing that their contributions are directly helping those less fortunate than themselves. Whilst studying for my degree in Geography, I decided to visit the Project. There were two main reasons. Firstly, I was fascinated by Alice's stories (see below): I wanted to immerse myself in this unfamiliar world where I would be able to help and be involved in the daily village activities. Secondly, I had chosen to research the Project for my dissertation, focusing on the villagers' ethos and passion for sustainable development. My days were mostly spent in the school teaching English to the children. Preparing lessons and marking school work took up my time. One memorable weekend, the children sang a song for me, expressing their gratitude to 'Madam Natasha'! Most evenings, I was in the Dispensary, learning a great deal from the nurses, and having language lessons! Two years later, I was delighted to return. 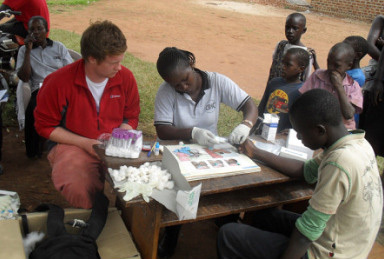 The majority of my time was spent with Dan in the recently established HIV/AIDS Clinic. It was fascinating to learn about such new projects and helped me to understand where all the money raised is being spent. The improvements in only three years were immense - our donations are truly making a difference. I would encourage everybody to keep fundraising and helping the community in Kanyike - the rewards are indescribable. I spent four weeks working with the Kanyike Project. I was about to study Medicine,so I spent time at the dispensary and with the community-based health care teams, as well as teaching science at the school; the teaching was the most fulfilling part of my trip as, unlike English teenagers, these children were eager to learn and wouldn’t let me end the lesson until they had completed all their work! I'm now a qualified doctor and have never forgotten the project. The experiences there increased my self-confidence and independence, as well as broadening my medical knowledge. The opportunity to meet people and talk about their experience of living in poverty and with HIV, was invaluable to a future doctor. I was one of the first volunteers to visit the Kanyike Project from the UK, spending three months there during my gap year between Sixth Form and university. I knew I'd be helping in the school, so I gained a TESOL (Teaching English to Speakers of Other Languages) qualification but in practice I was more of a classroom assistant than English teacher, since Ugandan English is not the same as English English. Education is an integral part of the Kanyike Project and everyone at the school was wonderful to me. 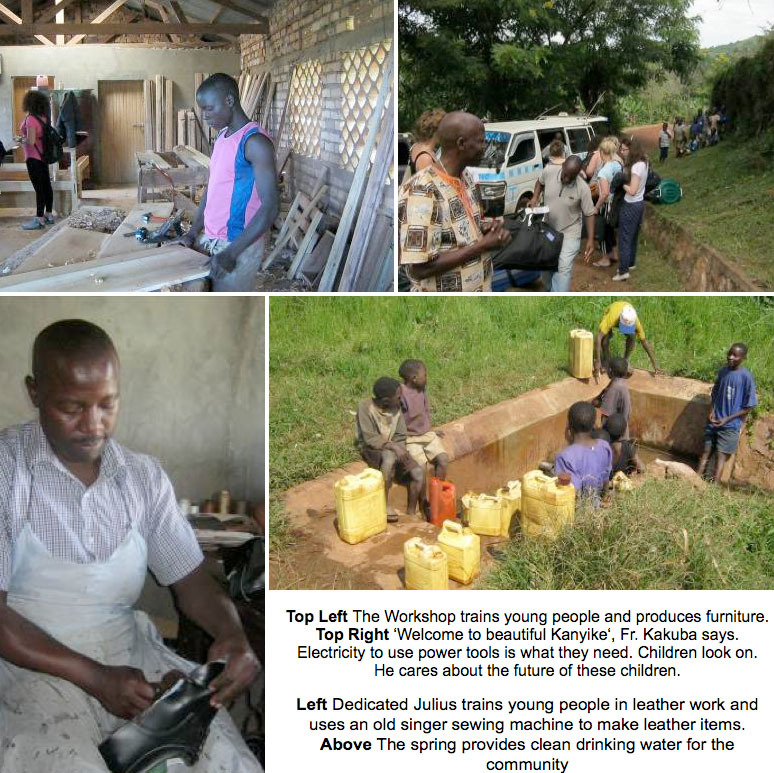 The Skills Centre was fascinating: I watched Julius and Deus at work and even learnt how to make my own sandals. I was so impressed by the development initiatives and the inclusive nature of the way the Project works that I have never left it behind me. When Sr. Joan asked me to join the Board of Trustees in 2008 I readily accepted. The people I met in Uganda may have very little but they are the most kind and generous in the world, and they are willing to work hard to achieve their dreams. I'm honoured to feel that I can help them do this.